NOTICE: Activation key must be used on a valid Steam account, requires internet connection. ABOUT THE GAME	FIRE is a Puzzleventure with intuitive puzzle design. Without losing many words it tells a savagely hilarious story. 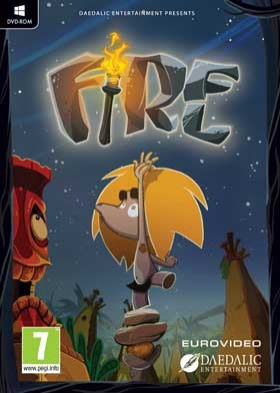 Journey into the Stone Age and face the most challenging task of this era: The search for fire! This story's hero is the lovably chaotic Neanderthal Ungh who dozes off durin… g his very first night watch. The next morning, the catastrophe ensues: the fire's gone out and Ungh is banished from his village. Now you have to help Ungh finding a new flame, searching every corner of the Stone Age world. No matter if he has to search the insides of a dinosaur, smoldering volcanoes or even through time itself, there is no place Ungh wouldn't look for new fire. One click or swipe and your environment comes to life. A small dash of logic and you'll be able to solve any puzzle and there will be no limit to your exploratory spirit while interacting with the game's world: fire coconuts from a mammoth's trunk, turn into an animal or save the fair maiden from the Octo-Boss' grasp.KEY FEATURES No text or dialogue at all Coherent and intuitive controls Explore a lovable, vividly animated Stone Age world 10 beautifully hand-drawn sceneries Atmospheric soundtrack by the composer of The Night of the Rabbit SYSTEM REQUIREMENTS Windows Minimum: OS Version: Windows XP 32 Bit Processor: 2,7 GHz Dual Core Memory: 2 GB RAM Graphics: nVidia GeForce 8600, Radeon HD 6570 DirectX Version: Version 9.0c or higher Disk Space: 10 GB available space Sound Card: DirectX 9.0c Compatible Sound Card with Latest Drivers Additional Notes: Using the Minimum Configuration, we strongly recommend to use minimal settings in order to not experience low frame rates.MAC	Minimum: OS Version: 10.7 Processor: 3.06 GHz Intel Core i3 I3-540 (Clarkdale) Memory: 4 GB RAM (1333 MHz PC3-10600 DDR3 SDRAM) Graphics: ATI Radeon HD 4670 DirectX Version: 10.1 Disk Space: 6GB Sound Card: 16Bit Linux	Minimum: OS: Ubuntu 12.04 and 14.04 Processor: 2,7 GHz Dual Core Memory: 2 GB RAM Graphics: nVidia GeForce 9600, Radeon HD 6570 Hard Drive: 5500 MB available space Sound Card: 16Bit © 2015 Daedalic Entertainment GmbH.Fire, the Fire logo and the Daedalic logo are trademarks of Daedalic Entertainment GmbH. All rights reserved. In cooperation with Eurovideo Medien GmbH.